A cable float type level switch incorporates a switching mechanics, microswitch or reed type switch, inside of a float assembly usually constructed of durable polymer materials or stainless steel. The float element is attached to a prewired electrical cable of varying length. The cable float type level switch can be suspended inside the containment vessel by the cable itself or multiple cable float level switches can be attached to a suspension cable allowing multiple switch points with a single entrance into the vessel. The other types of float type level switches are twists on the same basic principle. Sid mount units have a float element rigidly attached (not cable) to an enclosure that is used for mounting the level switch on the side of a tank. The name implies its primary use, side mounted on a tank or other vessel. These float type level switch units can use either microswitch or reed switch elements. They are typically made of stainless steel and can handle higher temperature, pressure and hazardous environments. The float type level switch is reliable, cost effective and can be used in a wide range of applications. Aplus Finetek offers the FA/FB Cable Float Level Switch, FC/FD Mini Float Level Switch, FC/FD Magnetic Float Level Switch and FF Side Mount Float Level Switch product lines. 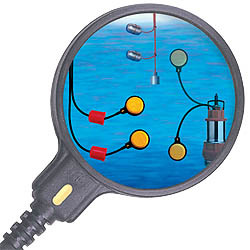 For more information on the FA/FB series go to the FA/FB Series Cable Float Type Level Switch product page. For more information on the FC/FD Series product line go to the FC/FD Mini Float Level Switch product page or the FC/FD Magnetic Float Level Switch product page. For more information regarding our FF Series go to the FF Side Mount Level Switch product page. Or, contact us at .